Department of Art | FSU Museum of Fine Arts: 3 Day Sale of Art, Antiques, Fine Crafts & Priints! Home » FSU Museum of Fine Arts: 3 Day Sale of Art, Antiques, Fine Crafts & Priints! 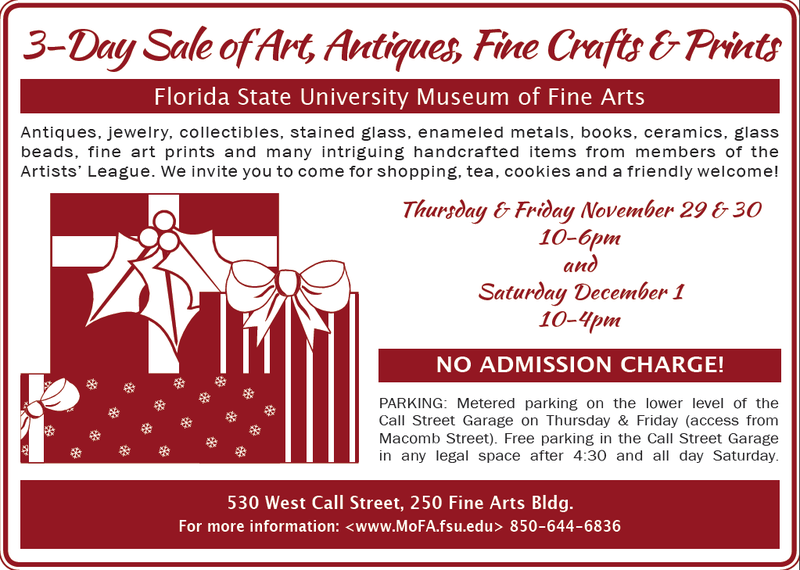 FSU Museum of Fine Arts: 3 Day Sale of Art, Antiques, Fine Crafts & Priints! Antiques, jewelry, collectables, stained glass, enameled metals, books ceramics, glass beads, fine art prints and intriguing handcrafted items from members of the Artists’ League. We invite you to come for shopping, tea cookies and a friendly welcome!